Some years ago, Peter Z wrote a blogpost about using MySQL Sandbox to deploy multiple server versions. Last February, Giuseppe introduced us to its successor: dbdeployer. In this blogpost we will demonstrate how to use it. There is a lot of information in Giuseppe’s post, so head there if you want a deeper dive. First step is to install it, which is really easy to do now since it’s developed in Go, and standalone executables are provided. You can get the latest version here. If you have your ~/bin/ directory in the path, you should now be able to run dbdeployer commands. 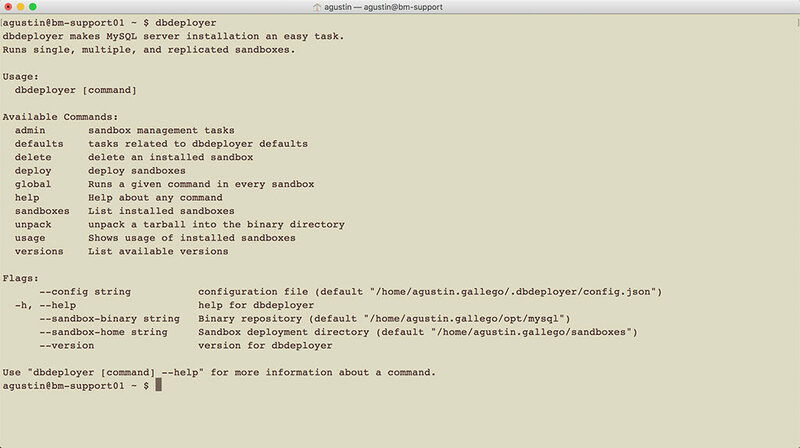 Let’s start with deploying a latest version vanilla MySQL sandbox. In the Support Team, we extensively use MySQL Sandbox (the predecessor to dbdeployer) to easily run different flavours and versions of MySQL so that we can test with the same versions our customers present us with. We store MySQL binaries in /opt/, so we can all share them and avoid wasting disk space on duplicated binaries. The first step to using dbdeployer is getting the binary we want to run, and then unpacking it into the binaries directory. This command will extract and move the files to the appropriate directory, which in this case is under /opt/mysql/ as overridden with the --sandbox-binary argument, so we can use them with the deploy command. To create a new standalone MySQL sandbox with the newly extracted binary, we can use the following command. You can read the dbdeployer usage output to have even more information on how the tool works. Next, let’s connect to it. And that was it! When creating the new instance, dbdeployer will try to use the same port as the version numbers concatenated. If that port is in use, it will try another one, or we can manually override it with the --port argument. We can also easily setup a replication environment with just one command. Again, you should run the recommended command to get more insight into what can be done. We can use the ./m script to connect to the master, and ./s1 to connect to the first slave. The ./use_all* scripts can come in handy to run commands in many servers at a time. Finally, we will see how to create multiple sandboxes with the same version at the same time. This could be useful for setting up environments that are not already covered by the tool, like Galera clusters or semi-sync replication. With this approach, we will at least have a base to start from, and then can use our own custom scripts. dbdeployer now has templates, which would allow extending functionality to support this, if needed. I have not yet tried to do so, but sounds like an interesting project for the future! Let me know if you would be interested in reading more about it. Using centos 6.8 on amazon azure. Also tried out some time back, the DB deployer but never found a way to install in my local MAC machine as there is no binary available for Percona Server on Mac OS. A *BINARY* TARBALL of Percona Server 5.7.22 for Mac OS, is required in order to test with DB deployer, on a MAC OS. Is there a way where we can get the Percona Server tar ball binaries for Mac? Sorry for seeing this article that late after publication. Thanks for covering the tool. Thanks for pointing this out, Giuseppe!